Neofinetia falcata — Cal-Orchid Inc.
Neofinetia hybrids are really great plants for people who enjoy the novelty of the more miniature plants or perhaps are city dwellers and just don't have much growing space. They do great on the windowsill. Through years of breeding one can now purchase plants of many different types of flowers and colors. An added bonus is that some of the crosses are extremely fragrant, most notably the blue Neostylis Lou Sneary. The hybrids also express hybrid vigor making them, in many cases, easier to grow than the species. Another nice thing about these hybrids is that they all have quite different foliage types; whether the robust Neost. Pinky or style of the very petite Neost. Baby Angel or Chrisnetia Green Light. We are constantly sourcing new hybrids, so please check back often to see what new ones we have to offer. Temperature-- In nature, the temperature for the species ranges from nearly freezing well into the mid 90s. Some cultivars have been photographed with a dusting of snow. Optimal conditions would be day temperatures in the mid 80-85 degrees with night temperatures in the 55-60 degree range. This what is generally found in an intermediate greenhous or as in the home and under these conditions you will see very strong lush plants. Light-- Bright filtered light seems to be what is best, maybe even a little brighter due to it's Vandaceous nature. This is similar to what is preferred for cattleyas. Leaves should be a nice green color maybe even with a tint of red. Though the plant will grow well under shady conditions, it will be reluctant to flower well. Humidity and Air Movement-- As with other monopodial orchids, Neofinetia and it's hybrids grow best when not exposed to very dry conditions. Keep the humidity fairly high, in the 60-70 degree range. Good air movement will ensure that the growing conditions are fresh and remember, keeping the leaf temperature down assists in preventing disease. 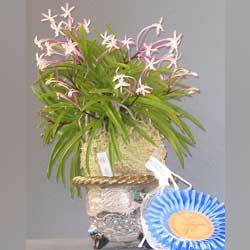 Water and Fertilizer-- The summer is Monsoon season where Neofinetia and it's various hybrid parents exist. This means that you should provide ample watering in the hot Summer months, perhaps two to three times a week. The plants become fairly dormant in the fall and winter months which means that water should be cut back. In Japan, they often let the plants go almost completely dormant. The root tips are good indicators of when water practices have been appropriate. Fertilize quite often in the growing season with any balanced formula, giving less in the winter season. Potting-- There are many ways Neofinetia and it's hybrids can be grown. Our preferred way is in a mixture of fir bark often with some charcoal. They are also great candidates for teak baskets. or on mounts. We even found them mounted on large black lava rock. Gorgeous! The traditional Japanese way is in pots with the plant perched up on a mound of New Zealand sphagnum moss. This technique requires high quality, pure water. In pots, many of the roots will spill outside the pot; don't worry, this normal. If the mix is old or if you water too much during the wintertime, you will surely rot the roots and so this should be avoided.